Where Can I be Treated? Neurocare is easily located to allow easy access for patients throughout the North West. 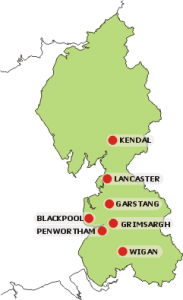 We have clinics in Wigan, Preston (Grimsargh or Penwortham), Blackpool, Garstang, Lancaster, Carnforth and Kendal. All the clinic rooms are accessible in a wheelchair and have disabled toilet facilities and parking to make you visit as easy as possible. Clinic appointments are flexible but generally 1 hour in duration to allow adequate time for addressing your problems fully. Rooms are fully private to allow us to dedicate the time to your treatment. For directions and more information about the location of our clinics, please click here. If the clinic environment is not for you, Neurocare is able to offer assessment and treatment in the comfort of your own home. We find this is of great benefit to those clients who find a clinic appointment too difficult or tiresome. Treatment at home can be more relaxing for some people and it also enables us to pick up your true difficulties in your own environment. Home exercise programmes can be easily setup, performed and practiced with you at home. We can properly assess your current aids, equipment and adaptions, and give advice if needed. We can also work with you to achieve your own goals at home, eg. being able to walk to the corner shop on your own, being able to get in and out of bed unaided, being more confident on your own stairs. It can be very beneficial in helping you achieve confidence to improve or retain your independence. We can work with your carers to advise on the best way they can help to make it easier for them, but also to help you regain some independence.